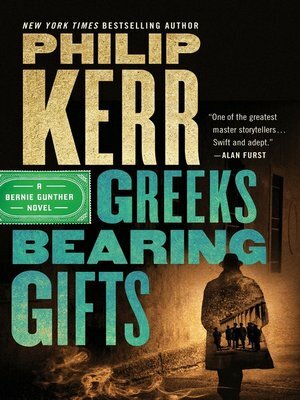 A vicious murder puts Bernie Gunther on the trail of World War 2 criminals in Greece in this riveting historical thriller in Philip Kerr's New York Times bestselling series. Munich, 1956. Bernie Gunther has a new name, a chip on his shoulder, and a dead-end career when an old friend arrives to repay a debt and encourages "Christoph Ganz" to take a job as a claims adjuster in a major German insurance company with a client in Athens, Greece. Under the cover of his new identity, Bernie begins to investigate a claim by Siegfried Witzel, a brutish former Wehrmacht soldier who served in Greece during the war. Witzel's claimed losses are large , and, even worse, they may be the stolen spoils of Greek Jews deported to Auschwitz. But when Bernie tries to confront Witzel, he finds that someone else has gotten to him first, leaving a corpse in his place. Working together, Leventis and Bernie hope to put their cases—new and old—to bed. But there's a much more sinister truth to acknowledge: A killer has returned to Athens...one who may have never left.